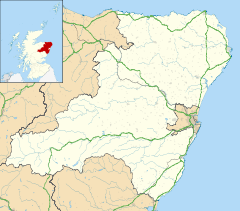 Banff is a town in the Banff and Buchan area of Aberdeenshire, Scotland. Banff is situated on Banff Bay and faces the town of Macduff across the estuary of the River Deveron. Banff is a former royal burgh, and is the county town of the historic county of Banffshire. The origin of the name is uncertain. It may be derived from the Scottish Gaelic banbh meaning "piglet"; buinne, a stream; or a contraction of Bean-naomh meaning "holy woman" (as reflected in the burgh's coat of arms which features the Virgin Mary). William J. Watson writes: "It is true that Banff is Banb in the Book of Deer and Banbh in modern Gaelic — one syllable. On the other hand, banbh, a suckling pig, is not appropriate — one might say it is impossible — as the name of a place or district." Banff's first castle was built to repel Viking invaders and a charter of 1163 AD shows that Malcolm IV was living there at that time. During this period the town was a busy trading centre in the "free hanse" of Northern Scottish burghs, despite not having its own harbour until 1775. The first recorded Sheriff of Banff was Richard de Strathewan in 1264, and in 1372 Royal Burgh status was conferred by King Robert II. By the 15th century Banff was one of three principal towns exporting salmon to the continent of Europe, along with Aberdeen and Montrose. There was a great deal of lawlessness in seventeenth-century Scotland, and some of the worst offenders were members of the nobility. According to records kept by historian William Cramond, the tolbooth (courthouse and prison) of Banff was, in 1628, the site of an altercation between Lord Banff and James Ogilvie, his relative. Reportedly, he struck James Ogilvie upon the head with a baton during a court hearing. Twenty of his friends and followers then attacked Ogilvie with swords before chasing him into the street and finishing him off with a pistol shot. Banff and Macduff are separated by the valley of the River Deveron. This unpredictable river was finally tamed by the seven arched bridge completed in 1779 by John Smeaton. An earlier bridge had been built in 1765, but was swept away in 1768. The old ferry was brought back into use, until it was lost in a flood in 1773. A public meeting was held in 1800 and passed a resolution for the building of a turnpike road between Turiff and Banff as the existing road was in a sad state of repair. Later 19th century transport improvements included the building of two railway lines, from Macduff to Turiff in 1860 and the Banff, Portsoy and Strathisla Railway in 1859 which connected to the main Aberdeen to Inverness line. During the 19th Century the Banff Fishery District (comprising the ports from Crovie to Sandend) was important to the herring trade, with production peaking in 1853 at more than sixty-thousand barrels, of which nearly thirty-four thousand were exported, however by 1912 production had declined to just over eight thousand barrels. Currently, the languages spoken in the town and in its vicinity tend to be the Doric dialect of Scots, and English. Banff has an oceanic climate, with mild temperatures year round. The modern-day town has a golf course (Duff House Royal), beaches, and was home to the Colleonard Sculpture Park which is now relocated in Aviemore. The townscape, which is one of the best-preserved in Scotland, has many historic buildings including fragments of the former royal Banff Castle, a pre-Reformation market cross, a fine tolbooth, many vernacular townhouses, and a museum donated by Andrew Carnegie. Close by is Duff House, designed by William Adam in 1730, and one of Scotland's finest classical houses. It is open to the public as an out-station of the National Gallery of Scotland. Also open to the public are the Wrack Woods, due south of Duff House. The woods contain an old ice house, a mausoleum, and a walk to the secluded Bridge of Alvah, a single-arch bridge spanning the river Deveron. The Deveron is known for its salmon and trout fishing. Many of the nearby villages also contribute to tourism in the area; in particular Gardenstown and Pennan. Banff's Tourist Information Centre opens during the summer and can be found by St Mary's car park adjacent to St Mary's Parish Church on Banff's High Street. Their audio tours provide an insight into the town, its history and architecture. Though no longer a commercial port, the harbour has been subject to redevelopment during the latter half of 2006 and now has a marina which serves leisure traffic and small fishing boats. The newly constructed marina was only accessible +3hrs mlw due to heavy and rapid siltation. By 2012 the silting problem had been resolved and the entrance is kept dredged to Chart Datum which makes it accessible over longer periods of the tide, especially to boats of a metre or less draft. The Canadian town of Banff, Alberta with its National Park are named after Banff. Banff was served by the Banff, Portsoy and Strathisla Railway (BPSR) from 1857 (to Banff Harbour station), and the Banff, Macduff and Turriff Junction Railway belonging to the Great North of Scotland Railway (GNSR) from 1860. The latter went to Banff & Macduff station, almost a mile from Banff. The GNSR later took over operation and then ownership of the older BPSR line. 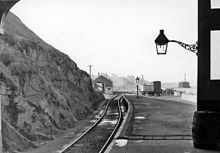 In 1872 the line to Banff & Macduff station benefited from replacement stations closer to the town centre of Macduff; Banff Bridge opened near the bridge between Banff and Macduff, on the Macduff side of the river, with its line then continuing into Macduff railway station. The original Banff & Macduff station closed on 1 July 1872. All the lines suffered from mid-20th century railway cuts, with Banff Bridge station closing by the end of 1951, and Banff Harbour (known simply as Banff from 1928) closing on 6 July 1964. The nearest open stations are Huntly and Keith, both around 20 miles away. Banff and surrounding areas have a local Highland League football team, Deveronvale F.C., Junior football Deveronside JFC and a rugby team, Banff RFC. Duff House Royal Golf Club course is bordered by the River Deveron and Duff House. Some interesting holes which can be difficult depending on the wind. ^ "Comparative Population Profile: Banff Locality". Scotland's Census Results Online. 29 April 2001. Retrieved 31 August 2008. ^ The History of the Celtic Place-Names of Scotland (Edinburgh and London, 1926, repr. 1993 by Birlinn Limited), p. 232. ^ a b Cooper, Alan (1999). Old Banff and Macduff. Catrine, Ayrshire: Stenalake Publishing. p. 3. ISBN 9781840330854. ^ "Banff Bridge". Engineering Timelines. Archived from the original on 4 March 2016. Retrieved 30 January 2014. ^ "Banff climate information". Met Office. Retrieved 17 October 2015. Wikisource has the text of the 1911 Encyclopædia Britannica article Banff. This page was last edited on 18 April 2019, at 18:22 (UTC).